Located in the southern Sierra Nevada, Kings Canyon National Park borders Sequoia National Park on the north. The two parks are jointly administered by the National Park Service. Its old-growth coniferous forests are replete with ponderosa pine, incense-cedar, and giant sequoias. Day hiking is a popular activity in Kings Canyon National Park. The Grant Grove area of the park offers several great trails. The General Grant Tree Trail leads visitors to the General Grant Tree, a giant sequoia and one of the world’s largest living trees. The tree was named after Ulysses S. Grant, Union Army general, and our nation’s 18th president. Because of the tree’s immense size, it can be hard to photograph. The trail then leads visitors to the historic Gamlin Cabin and the Fallen Monarch (not to be confused with the Fallen Monarch in Yosemite’s Mariposa Grove). Another great trail is the Redwood Canyon trail. In order to get to the trailhead, visitors have to take a two-mile dirt road, six miles south of Grant Grove. The is a good summertime trail, since the dirt road is closed during the winter. In Redwood Canyon, one of the largest of all the sequoia groves, visitors will encounter forests, meadows and shrubland. This is a good opportunity to learn about the fascinating relationship between the sequoia trees and fire. You might be surprised to learn that fire is essential in the life of a sequoia forest. Fire prepares seedbeds, cycles nutrients, reduces the number of trees susceptible to insect infestation and disease, and more. Rock Climbing is another fun activity in Kings Canyon. Rock climbing is best done during the spring season when weather is pleasant and most amenable. Bubbs Creek is a great place to find climbing walls. Charlito Dome and Charlotte Dome, located on the north side of the Bubbs Creek Trail just before it passes Charlotte Creek, can be difficult to get to but is definitely worth the extra effort. Backcountry camping is available for those who are willing to brave the remote wilderness. The Sequoia and Kings Canyon wilderness offers hundreds of thousands of acres to explore. Wilderness permits are required for all backcountry camping. Visitors should remember that it is important to practice proper food storage techniques; black bears roam the park and can easily get to food that is not stored properly. Kings Canyon National Park is open year-round, 24 hours a day. Summer is the most popular time to visit the park. During the summer, there are many free ranger programs available and most of the facilities are open. Come summertime, the snow has melted off the High Sierra passes and the weather is dry and hot. Between the two parks there are 14 campgrounds. All the campgrounds, except for four, are first-come, first-served. Lodgepole, Dorst and some group campgrounds can be reserved. Entrance to Kings Canyon and Sequoia National Parks is $20 per vehicle, or $10 per person, and valid for seven days. There is plenty of lodging available in the park for those who do not wish to camp. Open year-round, the John Muir Lodge is located near the Grant Grove area and features 36 hotel rooms and a restaurant. The lodge is managed by Kings Canyon Park Services. Black bears, common throughout Sequoia and Kings Canyon National Parks, are essential the area’s ecosystem. Native to the area, the black bear is the most common bear species. As omnivores, black bears usually eat mainly vegetation and salmon, but problems ensue when when black bears come into contact with humans and their food. The bears have been known to rip out the backseats of cars to get to the food in the trunk. As a result, the Sequoia and Kings Canyon National Parks have instituted a bear management plan. Designed to protect humans and bears alike, the plan involves requiring proper food storage techniques, decreasing bear-human interactions and educating the public. While the area has been inhabited by Native Americans for thousands of years, it wasn’t until famous naturalist John Muir explored its forests in 1873 that it started to gain national attention. Muir was captivated by the area’s beauty and similarity to Yosemite Valley. He hypothesized that both the valleys were formed during the last ice age by massive glaciers. Harold Ickes, the United States Secretary of Interior, realized that the area was special and fought to make it a national park. A bill creating Kings Canyon National Park passed in 1940, but not all of the area received protected. Urban planners and developers wanted to construct a giant dam through the western end of the valley. But in 1965, the western valley and Tehipite Valley was added to the national park, increasing its size and ending the debate. 1890 – General Grant National Park established. 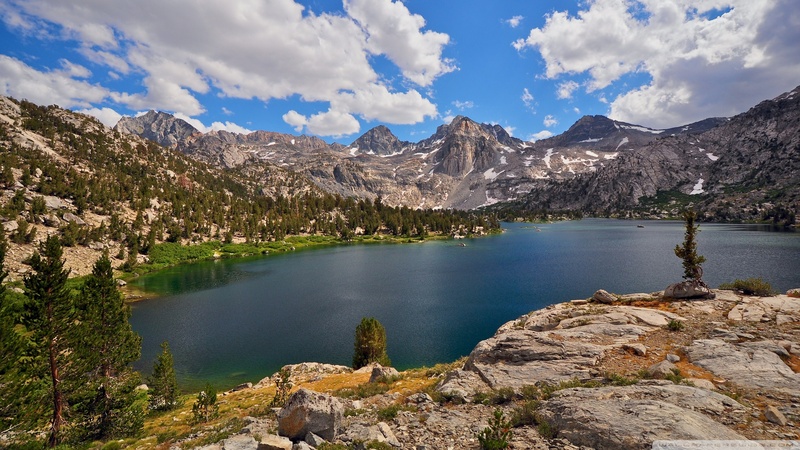 1940 – General Grant National Park is absorbed into Kings Canyon National Park. 1926 – President Calvin Coolidge declares the General Grant Tree the nation’s Christmas tree. 1970s – The park implements a bear-management plan. Click to see a detailed Kings Canyon National Park map.